Lisa Tarca is the Chief Operating Officer at The Hunger Project Australia. Lisa has forged a career in advocating human rights and justice although her journey started in a very different sector of work. By taking advantage of her background and experience in economics, information systems management and consultancy, Lisa has been able to assist the not-for-profit sector in visioning their passion for creating a just and right world by applying forward thinking business strategies. In her spare time, Lisa has volunteered with Boomalli Aboriginal Artists Cooperative and The Song Room. Lisa talks to Dalton Koss HQ about her career journey from the business sector to human rights advocacy in the not-for-profit landscape and the importance in maintaining a work life balance. From a professional viewpoint, I started my career in the early 1990’s with Accenture. As a learning organisation, they are excellent and recognise the importance of investing in their employees. They were progressive and one of the first organisations that I was aware of that promoted women up the ranks. Any employee who had the desire to learn was provided with an opportunity to move forward. There was a “work hard and play hard” mentality. You needed to be willing to give a lot to the organisation, but they gave a lot back. I had mentors and learned skills such as people management, even if it was provided in a clinical manner. My Bachelor of Economics and Masters in Information System Management allowed me to pursue the application of technology systems within a corporate structure. From Accenture I moved to one of my clients Verizon. This move to a client was a risk. As a leader you need to know which risks to take. I had a team of 200 people and budget of multiple millions of dollars. There was a lot of pressure and I didn’t think I was ready for it. After chatting to a lot of supportive friends I convinced myself that I could do step into this leadership role. Even with this confidence I needed the extra support to make the tough decisions. However, this experience taught me that I could stand on my own. I was working and living in New York with an office on the top floor of the building located near the CEO. There were late nights and weekends, and there were sacrifices. I also negotiated in this role that I needed space to be a mother. I did this role for 4 years and it was fantastic. During my time at Accenture I was living in New York when 9/11 happened. I helped out at the Mayors Office as a volunteer. This voluntary experience was an epiphany for the professional direction I would take for the rest of my life. I am lucky to have organisational and project management skills that can be applicable to other causes that make a real difference in the world. It was this dilemma that I faced when I took on the Verizon role. I was already in the headspace of wanting to create change. But I took on the Verizon job so I could build my skill sets. I decided that four years was enough. I didn’t want to go any higher; I wasn’t interested in the CIO position. It was an exciting time, but I wasn’t prepared to give my heart and soul. Work life balance was far more important to me. This role gave me financial security and flexibility to make other choices. On leaving Verizon, I decided to take some time off to research the non-profit/for-purpose sector. I attended workshops and trained myself. I wasn’t set on an ideal of what I wanted to do. There were certain causes that spoke to me such as human rights. My family background includes refugees from World War II and so I had a personal interest in human rights. From a leadership perspective it is important to realise your passions and what makes you tick. Belief and passion is integral to being a leader. I wanted to incorporate IT into for not-for-profits after noticing this gap in my research. With this in mind, I met Mel Washington from Human Rights First and discussed with him the opportunities I saw for the sector in adopting new IT approaches in their daily business. This led me to applying for an IT role at Human Rights First. It was the first time in 15 years that I had to sit for an interview and it was a little daunting. I was fortunate to be offered the position. I took a major pay cut, but that was fine as I was more fulfilled by this position and the salary was enough to cover my basic needs. I went from managing 200 people to Director of IT with a team of three. The first year was one of the best times professionally speaking. It was so much fun and such a great team. I added value immediately. It was a pleasure being part of a team that turned around thinking to creating a difference. I stayed at Human Rights First for 4 years. Mel left, and I was promoted into his role of Chief Operating Officer. Shortly thereafter, our Chief Financial Officer also resigned, at the same time as the start of the global financial crisis. Due to a high dependency we had on foundations which were invested with Bernie Madoff, we lost 20% of our funding in one day when the Madoff scandal was revealed. It was during this period that I assumed responsibility for the finance function, with help from a new Director of Finance, and under the guidance of the organisation founder and a relatively new CEO. It was a challenge. We had to let go of staff. It was essential that I delivered this information in a way that was compassionate and organisationally responsible. During this period, the love of my life finished his Masters in Finance and we knew we were moving back to his home country of Australia. I decided to take a sabbatical to pursue other interests before our move to Australia. I did consulting with Human Rights First for the first 6 months and to this day I still maintain a relationship with this organisation. Whilst visiting Melbourne, I did a barista training course. I completed a month-long intensive yoga teacher training at an Ashram in the Bahamas, and then became a yoga instructor for a short time whilst living in Santa Fe, NM. During this time I also worked as a barista and volunteered with Human Rights Alliance and coordinated the LGBT parade. These experiences provided me with a great network and friendships with eclectic people. When I came back to Australia, I initiated research into the Australian for-purpose sector. I connected with the Ethical Jobs Network. I found a link into Social Ventures Australia (SVA); a great organisation that bridges organisations that have capital to for-purpose organisations which need funding. Though I enjoyed this work, I felt that many of the projects were too short and I left them before seeing them through to completion. It was through my time with SVA which I started volunteering with Boomalli and The Song Room. Through SVA, I came into contact with the organisation One Laptop per Child (OLPC). Australia was not part of the OLPC business model, however, one entrepreneur – the eventual CEO of OLPC Australia – convinced the organisation that this project was vital in aboriginal communities. This same person convinced the then Gillard Government to roll out laptops to aboriginal communities that was supported with a $12 million budget. They asked me to come on board and help with their role out plan. I knew this project was to be delivered over a finite time. It was a risk, but I said yes. I was in this position for just under a year and the project came to a conclusion faster than I expected due to tensions between myself and the CEO. I still keep in contact with the alumni of this organisation. I found myself on the job search again. Via a SVA contact, I was informed about the Chief Operating Officer position at The Hunger Project Australia. I was interviewed and got the job. I am still in the same role at this organisation. I enjoy working with each individual in this organisation and have immense satisfaction from the work we deliver. 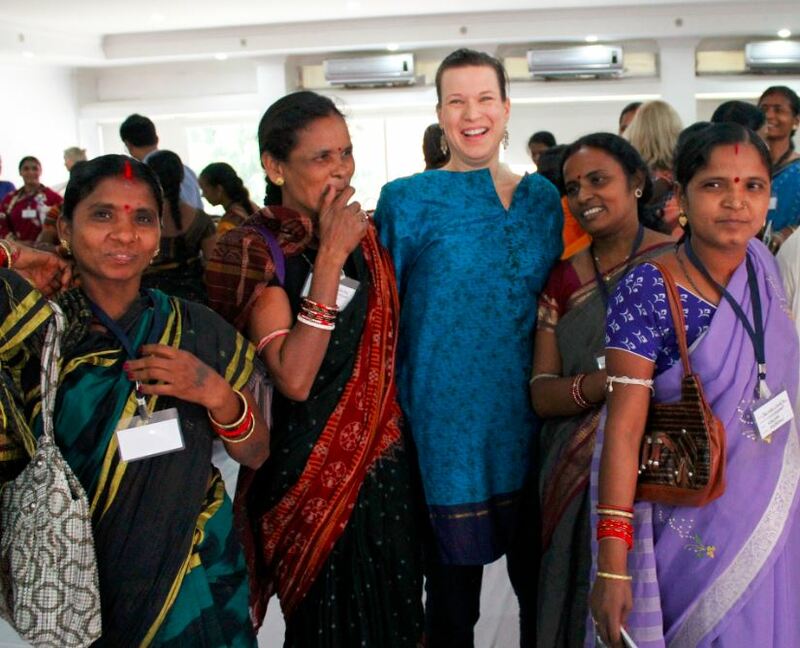 Lisa Tarca, COO of The Hunger Project Australia, working with community women leaders in India. 1. Responsible – In a past role, I completed the Gallup Strengths Survey, which includes 33 words to describe strength within the context of your professional effectiveness. There is no right combination; it is your personal attributes for leveraging your strengths. It creates a shift in your personal thinking moving towards positive working applications. Responsibility is one of my key words resulting from this survey. I am not one to stand aside when I see a problem. Rather I take responsibility for the issue, even quite often when I didn’t create it. By being responsible, I am also creating my integrity. 2. Connections – This word is attributed to my yoga spiritual teachings and practices. I believe we are all connected. We all have commonality and connection and I believe in the power of connection. In a leadership position, it is about using your connections responsibility and not exploiting them. You need to give back to those connections. Achiever– An effective leader gets the right stuff done and makes it happen. They understand the bigger picture of why stuff needs to get done. Compassionate – I have a Yin-Yang philosophy. Compassion and vulnerability is not a weakness. My role models have been the most compassionate people. Compassion opens the possibility for relationships. Committed – Leadership is taking and channelling your passion and committing to whatever it is that drives you. You need to be very clear on your purpose and then communicate this to those you lead. You need to align your passion to the work you are doing. You make the leap from understanding your passion to executing your passion. You are committed to doing that. There have been a number of successes, challenges and failures in my leadership journey. I have been very lucky with receiving a number of promotions and progressing well within those opportunities. I am also relatively successful in balancing work life commitments. However, I am continually challenged in whether I am getting my work life balance right. I am constantly recalibrating and revaluing while balancing my relationships. I didn’t succeed in my One Laptop per Child role that I set out to do. It was a learning experience but I gained some of the most wonderful relationships. What felt like a failure at the time, was a learning experience in retrospect. My success comes from family support. My mother came to the USA as a German refugee and came out as a lesbian vegetarian campaigner later in life. Education was an important investment. I continually gain new perspectives from my current role at The Hunger Project Australia. We are lucky. There are so many people who are suffering and experience hunger and I see myself as incredibly lucky that I was born into a life of opportunity. There is a natural cyclical pattern in life. Be conscience when you are in a good cycle and save money so there is flexibility later on during tough times. Reinvent yourself during tough times; you may have to sell your services in a different way. Be adaptable and flexible mentally, physically, emotionally. It makes you resilient. If you design your life to have support structures in place, you can survive, you become resilient. Wellbeing is a big part of my life. I do yoga 5-6 days a week and cardio exercise. I grew up with my mother farming organic produce and consequently buy organic whenever possible. To maintain my mental wellbeing, I keep studying. I am currently learning Italian and chat about politics and problem-solving with my Mathematician husband over dinner. Taking time to reflect, balance, recharge, skiing and visiting family in the USA keeps me ahead in life. I advance my knowledge in a particular area to learn new things. I stretch myself by investing in new challenges. It is not about staying ahead of the game; rather I invest in life so I can keep growing. For those who want to transition from corporate roles into the Not-for Profit landscape I strongly recommend the Ethical Jobs Network (www.ethicaljobs.com.au). I also suggest reading the Social Venture Australia’s quarterly magazine where contributors are leaders in Not-for –Profit organisations (www.socialventures.com.au). The stories promote the sharing of incentives and ideas for creating a great culture of rewards and strategy. Business Chicks Australia also provides an amazing network that connects women entrepreneurs across all ages in Australia (www.businesschicks.com.au).